You'll love the looks you'll get from your guests when you make this one up at your next Burger Bash! However, as strange as it sounds, this Peanut Butter and Bacon Burger really has amazing flavors, and will give you the recognition you deserve as the most eclectic cook in your group. 1. I usually purchase Hamburger Meat in a 2# Chub (Tube). It makes it real easy for portioning out 4, 1/2 pound burgers. Just slice the Tube in half, then each half into halves again. 2. Now it's time to form them into patties. Set one 1/2 pound patty on a piece of parchment paper, place another on top, then press with a plate. You'll end up with a perfectly round, and even thickness patty that's tender, and easy to cook. One of the things that produces a tough, hockey puck style burger is overworking the meat. This is a Restaurant Method of forming the patties that results in a real tender burger. 3. I had some Slab Bacon in my Frig. and, after removing the rind, I sliced it into real thick pieces. Mix the rub then coat the bacon with it. Cook over a medium fire on one side of the grill, while you're cooking the Hamburgers on the other side. 4. Cook the burgers over a fairly high heat. They won't plump up in the middle if you turn them frequently. A Hamburger puffs up in the middle because the heat is too high. The outside crusts up, and keeps any moisture from escaping. The moisture then expands, and you've got a burger that's real fat in the middle. Coat both sides of the roll with peanut butter, place bacon on the bottom piece, then the burger, and finally the top of the bun. 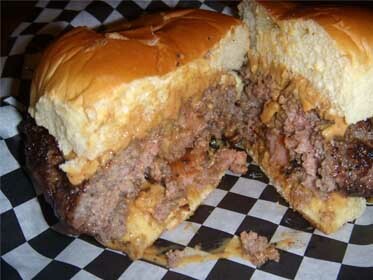 The heat of the burger and bacon will melt the peanut butter into one glorious mass. You'll love it! In case you've just run out of Sam Adams, this burger also goes well with ice cold milk like a PB and J would.